Congratulations to V-Reds forward Hunter Tremblay who has signed a one-year, two-way deal with the Edmonton Oilers. Not much needs to be said about #7's stay at UNB, all-time leader in points, two time CIS Champion, and a treat to watch for the past 4 years. Update: Bill Hunt has more on Tremblay in Friday's edition of The Daily Gleaner. A healthy contingent of hockey fans made their way to Officers Square Wednesday afternoon to pay their respects to all the championship teams in the city. The V-Reds showed off their new hardware and lined up with the midget AAA Canadiens, UNB Red Blazers and the Fredericton High School Black Kats for a few photos. With the season now over, fans are starting to turn their focus to which players are moving on. We'll have plenty of time to discuss this in the off-season, but for now we're just going to enjoy the win. Championships don't happen every year, and so much has to go right for it to happen again. So enjoy the off-season folks. In the meantime, Bruce Hallihan touches on the recruiting subject in today's Daily Gleaner. David Ritchie points out how the teams of the past all contributed in their own right to the championship winning program the the V-Reds have become. We won't even try to rehash the point here, but needless to say it's bang on. It's resonating with fans too, who can be heard recalling heroic stories of the squads from the 80's, 90's and last decade on any given night at the Aitken Centre. Mayor Woodside is calling Fredericton a 'City of Champions'. To celebrate the V-Reds big win, along with those of the UNB Red Blazers and Fredericton Midget AAA Canadiens, a celebration is planned at 12:15 pm this Wednesday at Officers Square. Don't miss it! Well, the season has come to a close, and the boys made us all proud. Hunter Tremblay has finished his fourth year with an amazing 201 regular season points and 232 career points (including playoffs and nationals). His full career numbers can be found here. The Varsity Reds thrilled the hometown crowd by defeating the McGill Redmen 4-0 to capture their 4th CIS National Championship. Scoring for UNB were Luke Gallant with the game winner, Daine Todd with a pair, and Matt Fillier. This team's strength was total commitment to 2-way play. The V-Reds defenders did an excellent job at keeping a high-skilled, dangerous Redmen offence to firing shots from the perimeter and limited rebound. Travis Fullerton did what he does best and posted another shut-out, his second of the tournament. Shots on goal were 27-28 in favour of the Redmen. Tournament MVP went to Luke Gallant, tournament all-stars went to Travis Fullerton, Luke Gallant, Jonathan Harty, Kyle Bailey, and Chris Culligan. McGill's Maxime Langelier-Parent also received all-star honours. For V-Reds fans, this was the perfect ending to a terrific year, and erases the memory of last year's painful defeat. V-Reds fans deserve a pat on the back for making the atmosphere in the Aitken Centre incredible all weekend. It all comes down to a best of one tonight as the #1 V-Reds host the #2 Redmen at 8pm at the AUC. Both of these teams enter the finals with 2-0 records at the tournament thus far. The V-Reds, defeated Calgary 2-1 on Thursday, and then shutout Western 4-0 last night. The Redmen won their first game on Thursday, defeating the X-Men 2-1, then defeated Alberta decisively 6-3 to set up this #1 vs. #2 battle. These two teams have never met before at a CIS Nationals, but have done battle six times since the '83-84 season, the V-Reds having prevailed on all those occasions. Kyle Bailey, Luke Gallant, and Josh Kidd all come into the final game with 3 pts (1G 2A) for the V-Reds, while Guillaume Doucet and Max Langelier-Parent lead the Redmen with 3 pts each. The game can be seen on Rogers Sportsnet, viewed as a webcast on the SSN network, and listened to on CHSR Radio. In an exciting must win game, the Varsity Reds prevailed by a 4-0 margin. Culligan, Bailey, Gallant, and Tremblay scored for UNB. The VReds will play McGill tomorrow evening to determine the CIS championship. The CIS #1 ranked V-Reds take on the CIS #4 ranked Mustangs at 7:30 pm tonight at the AUC. 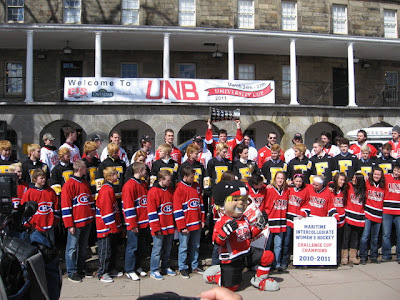 These two teams met two years ago in the National finals, with UNB skating to a 4-2 victory and their third CIS title. Lachlan MacIntosh scored a hat trick in that game. This will be a true semi-finals at the V-Reds and Mustangs both won their opening games of the weekend against Calgary. The winner of this game advances to the National finals Sunday night. Josh Kidd was the hero of game 1 for the V-Reds as they beat Calgary 2-1, and Kevin Baker picked up the first game honors for the Mustangs with 2 pts (1G 1A) in their 3-2 victory over Calgary. The #2 ranked McGill Redmen take on the #3 ranked Alberta Golden Bears at 2:30 pm at the AUC. These two teams last met at Nationals on March 21st, 2008. Alberta skated away with that contest, outscoring McGill 7-3. For McGill, the path to the National finals is a win by any score, for Alberta, it is a little more complicated. Alberta must win by four or more goals to guarantee a trip to the finals. If Alberta wins 3-0, they must then have a shootout with StFX to determine who goes to the finals. If Albera wins by three or less goals, but not by a score of 3-0, then StFX goes to the finals on Sunday. After suffering a disappointing loss to the No. 2 McGill Redmen in day one of the University Cup the StFX X-Men found a way to defeat No. 3 Alberta Golden Bears. Winning 3-1 the X-Men have kept themselves in the tournament. Whether they will make Sunday’s final depends on the result of the final Pool B game tomorrow between McGill and Alberta. As StFX head coach Brad Peddle said after the game they will be hoping for Alberta. Keeping their team alive was no easy task, but as Peddle said that it all started with the first shift. Scoring that first goal came late in the first period off the stick of Phil Mangan, in a period dominated by StFX. The Golden Bears mustered three quality chances towards the end of the period on the power-play, but StFX goaltender Joseph Perricone had a few huge pad saves. In the second period StFX continued to get into penalty trouble, taking as Spencer McAvoy got called for interference. Alberta capitalized on the powerplay with Derek Ryan putting the puck past Perricone. The Golden Bears did not sit back there and midway through the second had a 2-on-0 opportunity, which amounted to nothing as the shot went wide. Perricone discussed his thought process as the Golden Bears came in on him. Just past the midway point of the period StFX found themselves in the penalty box after taking a checking to the head penalty. Although Alberta put two shots on goal, StFX dominated offensively even down a man, putting six shots of their own on net. The momentum continued to stay in the X-Men’s favour and with 2:05 remaining in the period R D Chisholm slapped it home from the point to give StFX another lead. Late in the period again the Golden Bears found themselves on the power-play and with 15 seconds left in the second Perricone had to use his glove to rob the Golden Bears of a goal, keeping his team up one. The third period kicked off with an early goal from StFX from Kevin Undershute, giving his team a 3-1 lead. This was the eventual final score, but did not come without a few scares from Alberta as Perricone continued to stand tall for his team and keep Golden Bear shots from finding the back of the net. After the game Alberta head coach Eric Thurston discussed what his team has to do tomorrow after today’s loss. He continued, discussing how his team had to ensure they were aggressive to start the game off against McGill. StFX will now await the result of tomorrow afternoons game between Alberta and McGill. The biggest goal in Josh Kidd’s career thus far came tonight with UNB. A slap shot from the point found its way to the back of the net pass CIS goaltender of the year, Dustin Butler of the Calgary Dinos with four seconds remaining in the game to give the Varsity Reds a 2-1 victory. Kidd discussed after the game how the play was something they worked on quite often in practice. Kidd continued saying he had not scored as big a goal in his career. Kidd’s goal came late to give UNB the win, but for much of the game the club did not have control of the game. In the first both teams traded off penalties with neither having success in before the intermission as Calgary seemed to have the momentum through the period outshooting UNB 11-7. 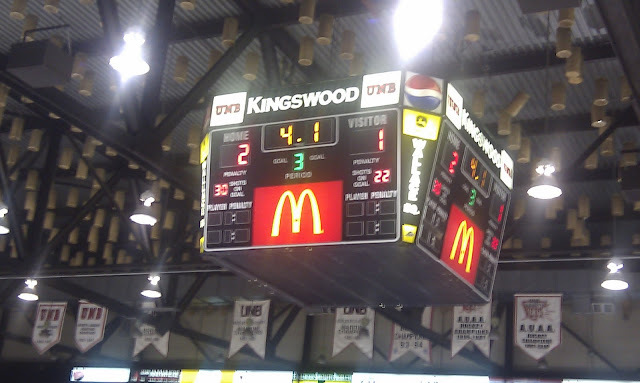 After a penalty by the Dinos at the end of the first, UNB had 1:36 remaining in the powerplay going into the second. Four seconds in Luke Egener picked up another penalty for Calgary, a four minute high sticking minor. This set UNB up for a 1:32 5-on-3. The Dinos killed off the first penalty, but with 55 seconds left in the powerplay UNB’s Jordan Clendenning found the back of the net assisted by Nick MacNeil and Lachlan MacIntosh to put the Varsity Reds up 1-0. Less than a minute later Marc-Antoine Desnoyers took a holding penalty. That was exactly what Calgary needed to get back in the game, with Teegan Moore putting the puck past Travis Fullerton 20 seconds into the power-play to even the game at a goal apiece. After the early excitement of the second, both teams remained scoreless for the remainder of the period going back and forth, but neither were able to take the lead going into the third. The third period was the most even of the game as both teams were back and forth with chances being equal. UNB’s best chance came to the right of Butler as Hunter Tremblay fanned on his shot with an empty goal with 3:42 left in the game. Calgary bounced right back and with 2:58 Fullerton came up with another key save to keep his team in the game, with Kidd’s goal eventually coming with four seconds remaining. UNB captain Kyle Bailey discussed his faceoff win that set up the goal. Although it was not the way the Varsity Reds wanted to win, head coach Gardiner MacDougall said after the game that it’s good to have a scare sometimes. UNB will play next Saturday night at 7:30 p.m. against Western, while Calgary plays Western Friday night at 7 p.m..
MacDougall says he is happy about the way the tournament schedule worked out for his squad. With 4.1 seconds left on the clock, Josh Kidd blasted a shot past CIS goalie of the year, Dustin Butler to give the V-Reds a 2-1 victory over the Calgary Dinos in game 2 of the University Cup. Also scoring for UNB was Jordan Clendenning who may have had his best game as a V-Red this evening. Travis Fullerton bailed his team out at times, stopping 21 of 22 shots. The game wasn't a classic by any means. The V-Reds seemed nervous at times while the Dinos seemed content to sit back and wait for opportunities to counter-attack. Edge in shots and in play went to the V-Reds, but this could have easily gone in favour of the Dinos with a fortunate bounce the other way. But good teams find a way to pull out wins and that's exactly what the good guys did this evening. The V-Reds will now play Western on Saturday. For UNB, a win will secure a spot in the championship game. The second game of the tournament features the hometown and CIS #1 ranked V-Reds taking on the #6 Calgary Dinos at 7pm at the AUC. This will be the third meeting between these two teams as the V-Reds travelled out west in the preseason and beat the Dinos 10-2 and 6-1 in exhibition play. This is the 11th trip to Nationals for both these teams, the V-Reds are returning after a one year absense, and the Dinos are returning for the first time since the 1999-2000 season. Calgary's goalie Dustin Butler was named as goalie of the year for the CIS last night, and is a big part of the reason why this team is in the National tournament this year. Forward Reid Jorgensen led the team in scoring with 33 pts (17G 16 A) in 28 regular season games this year. UNB's Hunter Tremblay leads in both regular season and career points in the history of the V-Reds, so far this year he has amassed 57 pts (44 regular season, 13 playoffs). Goaltender Travis Fullerton had the best GAA in the country at 1.60 and the best save percentange in the AUS at .928. The game can be viewed as a webcast on the SSN network, listened to on CHSR radio, and followed on UNBHockey on Twitter. The tournament kicks off with the #2 McGill Redmen taking on the #5 StFX X-Men at 2pm at the AUC. These two teams last met on December 29th in Antigonish in a Christmas exhibition game that saw the X-Men win their 5th Keating Cup with a 6-5 OT victory. This is the first time these two teams will meet at the Cup tournament. Mcgill has never advanced passed the semi-finals in five trips to Nationals, while the X-Men make their 11th appearance at Nationals, having last won right here in Fredericton in the spring of 2004 when they beat the V-Reds 3-2 in OT in the finals. The game can be viewed as a webcast on the SSN network and listened to on CHSR radio. If you were frozen in carbonite all year and didn't buy a tournament pass, fear not. We've learned there will be a limited number of game day tickets available at the box office. Any individual game tickets will be available on the day of the game only. The best way to ensure you get your tickets is to visit the Box Office at the AUC open at noon daily. Be warned, there are not very many left, so don't delay. These limited number of tickets will be available on a first-come first-serves basis. With March Madness going on down south and NHL playoffs just around the corner, we took it upon ourselves to have a little bit of fun with probabilities and extrapolate things to the CIS University Cup. Below are the unofficial chances for each team this week. These aren't meant to be insulting to any team, and every team has a fighting chance which is why the games are played. The numbers are based on a variety of factors, including strong weight on head-to-head match-ups, win/loss records, and University Cup history. Remember, winning the University Cup usually (but not always) means winning three separate best-of-one games (not best of 5 or best of 7 which tend to favour the better teams). We didn't exlude the chance of a 2-1 team winning gold, we just feel it very unlikely this year given the pools. As with the Vegas odds-maker models, there's always an element of subjectivity involved, so your numbers may vary, but we feel these are fairly reasonable guesses and are supported by evidence in recent CIS history. For example, we gave UNB just under a 60% chance vs STFX if those teams meet in the finals, but we gave Alberta an 80% chance of beating McGill. Finally, a team's chances at winning gold obviously improve dramatically with each win at the tournament. Western being higher might surprise a few people given how McGill handled them pretty easily in the OUA Final. This has more to do with the fact McGill is in the pool of death with STFX and Alberta, and if they were to emerge victorious, would have a higher likelihood of facing UNB in the final than Western again. So the road to gold is a big challenge for McGill. We actually gave McGill a better chance of winning head-to-head vs Western if those two teams meet in the final. Also note, there is a 68% chance that a team other than UNB wins Nationals. This is actually quite appropriate. According to Steven Knowles (the CIS University Cup history guru), since 1979-80, the #1 seed has won gold only 8 times. Further, the host team has only won 8 times out of 48 years, with Alberta doing so in both 2005 and 2006. So history does not favour the V-Reds. All this means absolutely nothing when the puck drops tomorrow, but might make for some good hockey-talk today, in what's sure to be the longest workday of the year for many of us. See things a bit differently? Let us know in the comments. Over at the CIS Blog, David Kilfoil has the scoop on the seedings and schedule for the University Cup. Note the 8 PM start for the University Cup Final on Sunday. Finally, it looks as though CHSR will be broadcasting all the games as well, good news for those of you at work limited to radio. 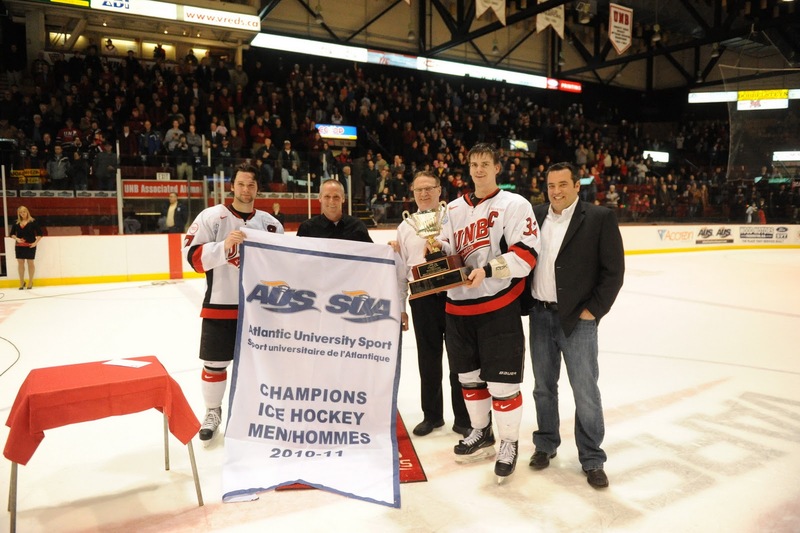 FREDERICTON – It seems somewhat fitting that the AUS men's hockey championship would end in overtime Friday night, just like the first two games of the series played at the Aitken University Centre. This time it was UNB captain Kyle Bailey (Ponoka, AB) scoring the winner at 3:43 of overtime, on the power play, to bring the sold out crowd of 3650 to their feet. The No. 1 ranked Varsity Reds squeak out a 5-4 Game Five victory over the No. 4 ranked StFX X-Men, and capture their first AUS championship since 2008, and their 12th banner all time. As could be expected in a championship game, there was a bit of edge to the play in the early going. StFX's Rob Warner (Whitehorse, YK) and UNB's Nick MacNeil (Creignish, NS) got tangled up alongside the UNB bench and both were sent off for two minutes for roughing after the whistle at the 34 second mark. The first goal of the game came at 6:14 when Hunter Tremblay (Timmins, ON) took a pass from Chris Culligan (Howie Center, NS) and beat Joey Perricone (San Juan Capistrano, CA) with a quick wrister through the pads. The noise after the goal was deafening, enhanced by the hundreds of UNB students who took advantage of the one-time opportunity to buy tickets for a only a dollar apiece. A couple of minutes later defenceman Marc-Antoine Desnoyers (Hippolyte, PQ) was unable to clear the puck out of the V-Reds zone, and the puck eventually came to Kevin Undershute (Medicine Hat, AB) who rang a heavy shot off the post. Midway through the period StFX had another glorious scoring opportunity when Brett Morrison (Howie Centre, NS) deked a UNB defenceman on the way to the net, but Travis Fullerton (Riverview, NB) made the save. UNB extended their lead at 16:45 and once it again it was Tremblay with the goal. This time he had a partial break thanks to a pass from Daine Todd (Stettler, AB) who made a good play to steal the puck. Perricone made a pad save off the rush, but the big rebound went right back to Tremblay who hammered the puck past the StFX goalender. A minute later Bailey was tripped up while driving the net by boyhood friend Mark Louis (Ponoka, AB) and the V-Reds went on the powerplay. UNB only generated one shot on goal with the man advantage, and the X-Men escaped to the dressing room down 2-0 while being outshot 13-8. Ten days ago StFX was down 2-0 after one period in Game 5 against Saint Mary's, and they came back in the second period to tie the game, and eventually win it it double overtime. Well the X-Men had a similarly dominant second period in this game, and they were buzzing the UNB net when power forward Bryce Swan (Alder Point, NS) knocked the rebound past Fullerton at 1:30. Two minutes later StFX co-captain Chris Hulit (Sault Ste. Marie, ON) was called for goaltender interference, but UNB once again wasn't able to score on the power play. StFX tied the game at 13:16 when Jason Bast (Moose Jaw, SK) was able to get around UNB defender Ben Wright (Foremost, AB) with the puck, and then make a pass through the slot to Undershute who had a wide-open side of the net to score into. At the time of the goal the shots were tied 15-15. That goal took the crowd out of the game for awhile, as they nervously waited for UNB to respond. StFX kept the pressure on and outshot the home side 13-2 in the middle period. UNB's Jonathan Harty (Oromocto, NB) took a slashing penalty right at the end of the second period, so StFX would have a power play to start the third period. UNB successfully killed off the penalty, and 26 seconds after that, they were back in the lead when Bailey fired the puck through a crowd and Perricone never moved until after the red light came on. UNB's penalty woes continued however. Jeff Lee (Calgary, AB) was called for high-sticking at 3:02. UNB killed it off. Defenceman Josh Kidd (Sundridge, ON) was called for elbowing after a heavy collision behind the UNB net. This time the X-Men scored to tie it up at 6:14 when Phil Mangan (Gananogue, QC) saw his puck from the high slot beat Fullerton over the shoulder and land just inside the far post. At 13:37 Culligan made a great individual effort to score, as he drew an interference penalty call against Nick Pageau (Stoney Creek, ON) as he broke out of the UNB zone and then on his breakaway Culligan was caught just as he drove the net as a StFX defencemen swept his feet out from under him, but by first playing the puck as decided by the referees. The fans wanted a penalty shot, but didn't get it. Highlighting the importance of the power play opportunity, UNB head coach Gardiner MacDougall called a timeout to plot a strategy for his team. Maybe it worked, because Desnoyer ripped a point shot through a screen at 14:17 that caught just under the crossbar. Perricone had no chance on the go ahead goal. As has been seen all series, the X-Men didn't let the goal deflate them, and at 16:43 Morrison scored in a scrum to tie it up yet again. No more goals came in the final period so the teams headed to overtime after a three minute break. UNB appeared to have the edge in the extra period, and twice StFX players committed what the vocal crowd thought were infractions against UNB players, but the officials disagreed. The third time it happened the crowd got their way, when Hulit was called for hooking in the V-Reds zone. One minute into the power play Jordan Clendenning (Fredericton, NB) got the puck to Bailey, and he got just enough on his shot to put the puck up and over the outstretched Perricone and into the net at 3:43. Pandemonium then erupted on the ice and in the stands as the V-Reds and their fans celebrated the moment. UNB outshot StFX 4-0 in the overtime and 25-23 in the game. Game Notes: Some lucky fan won $4312 in the 50/50 draw, the biggest payout of the season ... Luke Gallant and Taylor Procyshen did not dress for UNB ... Lachlan MacIntosh was back in the V-Reds lineup and Nick Layton was scratched to make room ... The game marked the 12th playoff game for the X-Men and the 9th for the V-Reds ... Three games in this best-of-five series went to overtime ... StFX will still advance to the Cavendish University Cup next week in Fredericton, most likely in a pool with Alberta and McGill while there is a good chance Calgary and Western will be in the other pool with UNB ... The tournament committee will set the pools, with the three conference champs seeded 1,2,3 based on the final Top 10 rankings. Captain Kyle Bailey scored the overtime winner to win the AUS Championship in front of a sold-out crowd at the Aitken Centre. Scoring for UNB were Hunter Tremblay with 2 goals, Marc-Antoine Desnoyers, and Kyle Bailey with 2 goals. Travis Fullerton was in net for the win. 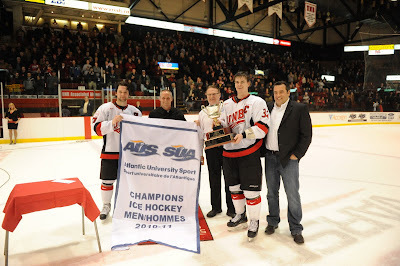 UNB takes the series 3-2 and are 2010-2011 AUS Champions. The game was a see-saw battle between two competitive teams. Hunter Tremblay opened the scoring in the first period around the 10 minute mark and would add his second goal of the game before the period was over. The StFX X-Men rallied in the second period for 2 goals and outshot the V-Reds heavily by a margin of 12-2. The third period would see the two teams exchange goals on a couple of occasions, but no winner was determined so this one went into overtime. With 6:17 left on the clock, Kyle Bailey fired a shot past the X-Men goaltender to end a historic game and secure the AUS Championship on home ice. After four games, nothing has been resolved, so tonight The V-Reds and the X-Men play a winner takes all game for the AUS Championship at 7pm at the AUC. Whatever hype we can throw into this game already exists in the minds of the players on both teams. The regular season... no longer matters. Previous games in the playoffs... no longer matter. Tonight is about the championship; tonight one team can say that they are the very best in the AUS for the 2010-2011 season. The game can be seen on Rogers TV, as a webcast on the SSN network, listened to on CHSR radio, and followed on UNBHockey on Twitter. Come out tonight, wear RED, and cheer on the V-Reds. The AUS announced the major award winners and all-stars today. Representing UNB as a First Team All-Star is Hunter Tremblay. Second Team All-Stars include Bretton Stamler and Chris Culligan. Nick MacNeil was named to the All-Rookie team. AUS MVP went to SMU's d-man extraordinaire, Andrew Hotham. 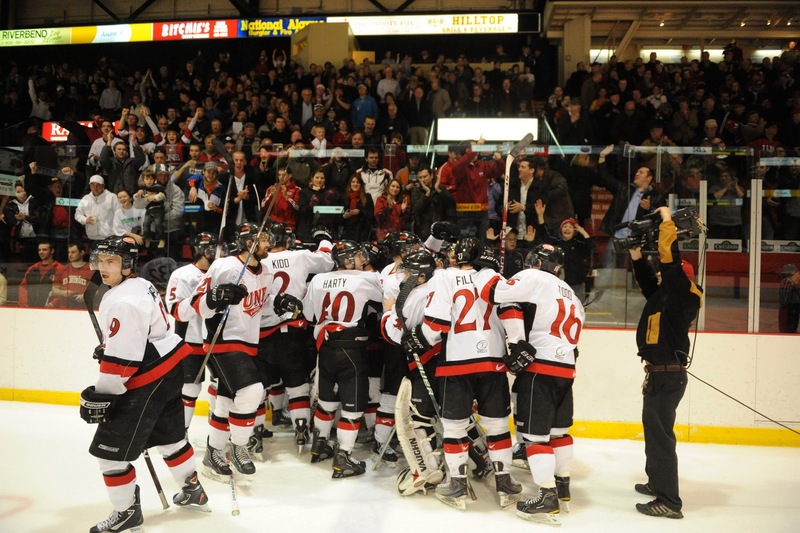 UNB was shut-out of the major awards, but they're probably not too concerned about those. You can read about the rest of the award winners over at the AUS site. ANTIGONISH – The No. 1 ranked University of New Brunswick Varsity Reds took a 2-1 lead in the AUS men's hockey championship Tuesday night at the standing-room only Keating Millennium Centre with a hard fought 2-0 road win over the No.4 ranked StFX X-Men, and UNB will be looking to end the series Wednesday night in Antigonish. UNB played a strong defensive period in the third period, bottling up the X-Men for the most part. After X-Men d-man Derek Claffey (Red Deer, AB) was called for tripping up the pinching Marc-Antoine Desnoyers (Hippolyte, PQ), the V-Reds got an insurance marker at 15:26 when rookie Nick MacNeil (Creignish, NS) beat Perricone with a wrister on a power play for his fourth goal of the playoffs. It was the first goal on the man advantage by either team in the series. MacNeil grew up less than an hour from Antigonish across the causeway in Creignish, Cape Breton. His father Andy was a star player for StFX in the 1970's and both his parents were at the game. Travis Fullerton (Riverview, NB) got the shutout for UNB, his second of the playoffs and seventh of the season. While not tested quite as often as Perricone, Fullerton did make 21 saves for the win and the StFX netminder made 23 saves. His head coach, Gardiner MacDougall, was understandably pleased with the V-Reds' overall play. “The execution was what was needed this time of year. I thought we had a good intensity level. Our execution got better as the game went. We put pucks where they needed to go. I thought we had a good grit level. Those are keys this time of year. We needed everybody. We got all four lines in. We got our six D in and Fully made the saves when we needed. 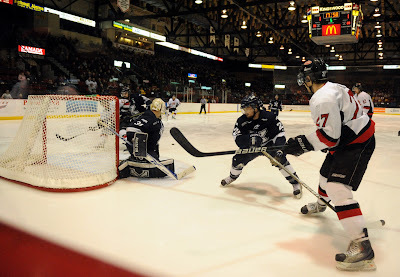 It was another classic game between two good opponents.” Notwithstanding the particularly strong game from Tremblay, MacDougall made a point to acknowledge the fine play of the three Nova Scotian forwards in the UNB lineup - Culligan, MacNeil and Matt Fillier (Durham, NS), all who were playing in front of family and friends. 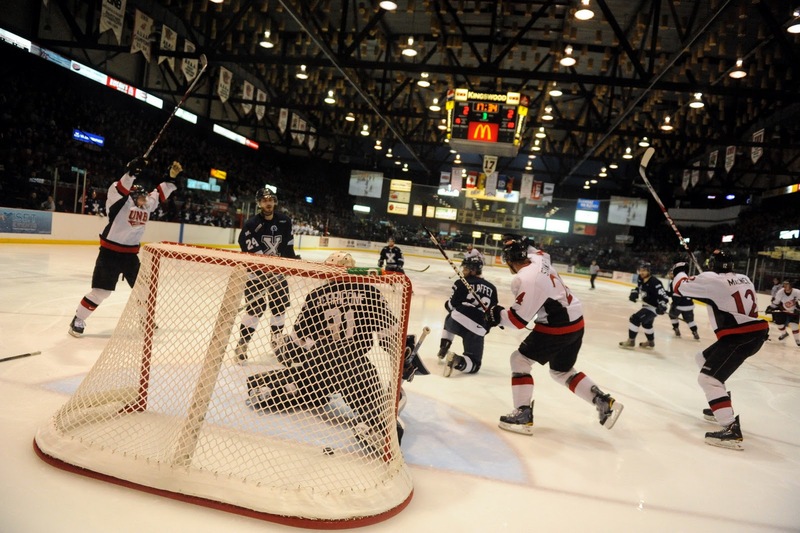 Game Notes: UNB last won the AUS championship in 2008; StFX in 2004 .. The paid attendance was 1987, the biggest crowd of the season at the KMC, and slightly more fans than StFX's two home games against SMU (1952 & 1981) in their previous series ... UNB was missing Lachlan MacIntosh, Luke Gallant and Taylor Procyshen from the lineup due to injuries ... If is a game five is needed in the series it will be played Friday night at 7:00 pm at the Aitken University Centre in Fredericton. Tonight, the V-Reds travel to Antigonish to take on the X-Men in game three of the AUS final at 7pm. The series, now tied at 1-1, comes down to a best of three now, with two games in the X-Men's arena, on their ice, with their fans. A win tonight will give either team a commanding lead in this series. The V-Reds and X-Men have put on a great series thus far, going into OT in both previous games and giving fans lots of highlight shots and saves at both ends of the ice. The game can be seen be seen as a webcast on the SSN network, listened to on CHSR Radio, and followed on UNBHockey on Twitter. 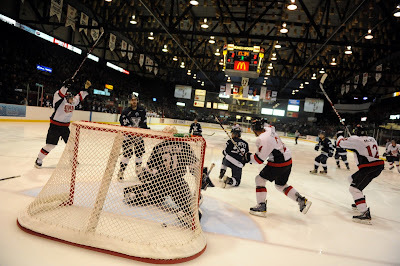 FREDERICTON – Like the night before, the winning goal in the playoff game Saturday between the University of New Brunswick Varsity Reds and the StFX X-Men was scored off a faceoff win in the southeast circle at the Aitken University Centre, in overtime. The difference was that is was the second overtime period and this time it was the X-Men winning the draw, and Phil Mangan scoring for the 2-1 victory, tying the best-of-five series at a game apiece. The first period saw the Varsity Reds come out with more jump than the night before, and a clear edge in territorial play. The first 20 minutes went by quickly, with few whistles to interrupt play in a tight checking, hard hitting period. UNB outshot StFX 10-4. The second period didn't see too much difference in the tight play, although there were more good scoring chances. Around the four minute mark UNB's Nick MacNeil (Creignish, NS) fired a shot that hit Joey Perricone (San Juan Capistrano, CA) high on the shoulder and then the tumbled onto the crossbar, but didn't drop into the net. At 14:15 the V-Reds had another great scoring chance when Chris Culligan (Howie Center, NS) on the rush let a heavy shot go that beat Perricone high but rang off the crossbar. Late in the period UNB got into penalty trouble when first Ben Shutron (Orleans, ON) retaliated against Matthew Bragg (Newmans Cove, NF) with a crosscheck after getting worked over in the V-Reds crease at 18:08 and then Spencer MacAvoy (St. Albert, AB) lost an edge while trying to skate around the penalty-killing Culligan, yet the UNB forward was called for tripping. The V-Reds did a good job killing off 1:19 of five-on-three play that carried over to the third period. Soon after killing off the last eight seconds of the five-on-three, UNB found themselves on the power play when Jason Bast (Moose Jaw, SK) was called for hooking while trying to slow up MacNeil. 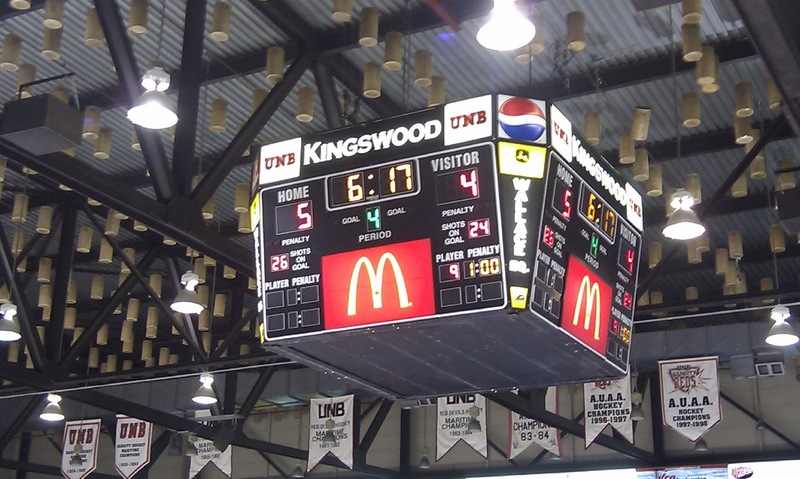 The X-Men killed off the penalty successfully, but UNB was still carrying more of the play in the third period. That is until 6:44 when Bragg was deep in the right corner of the UNB zone with the puck. He curled out of the corner, skating back to but just inside the blue line while avoiding V-Red defenders, across the width of the ice and then he skated down into the left faceoff circle where he finally snapped the puck through a screen that McAvoy redirected past Travis Fullerton (Riverview, NB). Once they had the goal, StFX reverted back to their defensive system, clogging the neutral zone as they tried to shut down the UNB rush. Around the twelve minute mark of the third period the game opened up, briefly, with chances at both ends of the ice. Bast managed to get in on Fullerton with two quick shots, but the UNB netminder made two great saves. The action went back the other way with Hunter Tremblay (Timmins, ON) on a breakaway, but Perricone stood tall to make the save. The V-Reds finally tied the game at 15:08 when they got the puck deep and icing was waved off. Matt Fillier (Durham, NS) got to the puck first behind the StFX net and passed to UNB captain Kyle Bailey (Ponoka, AB) in front. Perricone made the save on the Bailey shot. MacNeil scooped up the rebound and made a good shot, but another fine Perricone save. Bailey jumped on that rebound and hammered the puck into the open side of the net to bring most of the 2262 fans to their feet. With about three minutes UNB had a chance to take the lead with MacNeil on a partial break, but he couldn't get the puck past Perricone. Shots in the third period were 12-7 in favour of UNB. After a three minute break the two teams played a ten minute overtime period. Nothing was decided, although UNB had to kill off a hooking penalty to Jeff Lee (Calgary, AB) who was too aggressive on the forecheck in the offensive zone. Unlike the night before when the V-Reds dominated overtime, the play was more even. After an intermission, the teams came back out to clean ice for a 20 minute extra period. UNB had one good scoring chance and then there was a faceoff in the UNB zone at 2:42, to Fullerton's right. StFX centre Phil Mangan (Gananogue, QC) timed the drop of the puck to perfection, shooting instead of trying to win the draw back, and his shot found the gap just inside the post, surprising Fullerton and stunning the partizan crowd. It happened so fast that many couldn't believe what they saw, or didn't see, but the red light was on none the less. Mangan was mobbed by his teammates as the fans left the building in disbelief. Final shots in the game favoured UNB 35-28, who give up their first loss at home this season. It also the first time StFX has managed to beat UNB this year. Despite the loss, UNB head coach Gardiner MacDougall was happy with the overall play of his team, but he would have liked them to take better advantage of their opportunities. “You get four breakaways, you hope you're going to get one of them”. Games 3 and 4 will be Tuesday and Wednesday night at 7:00 pm at StFX's Keating Millenium Center in Antigonish. Game Notes: Mangan also scored the overtime series winner in Game 5 against Saint Mary's ... For the second game in a row neither team scored on the power play ... UNBers Luke Gallant and Taylor Procyshen were out of the lineup for the second consecutive game ... Game 1 overtime hero Ben Wright was not dressed and Josh Hepditch took his spot on the blueline. The STFX X-Men scored a quick goal off a face-off deep in V-Reds territory at 2:42 of the 2nd OT period to win game 2 by a 2-1 score. The game was a much better showing for UNB overall, the carried the edge in shots and territorial play, but they couldn't capitalize on scoring chances to put the X-men away. STFX scored early in the 3rd period to take a 1-0 lead. Kyle Bailey answered with a goal for the V-Reds with under 5 minutes remaining to send it to overtime. The series is now tied at 1-1 and shifts to Antigonish for games 3 and 4. The V-Reds had good success there this season, winning 6-1 and 2-1. They'll hope to continue that trend on Tuesday and Wednesday night. Tonight, the V-Reds host the X-Men for game two of the AUS finals. Last night, the V-Reds came from behind for a 3-2 OT victory, thanks to a goal by Ben Wright at 4:34 of the extra frame. Take a look at the Gleaner article for the full game summary. With a 1-0 lead in the best of five, the V-Reds will look to take a choke hold on the series at 7pm at the AUC. Come out and support the V-Reds!! The first game of the best-of-something happens tonight at 8pm at the Aitken Centre. The oppponent: the STFX X-Men. The same team who crushed UNB's perfect season attempt last year, and then curb-stomped their playoff run in 3 quick games. Think this series is just a trivial warm-up for the two teams advancing to Nationals? Not a chance. Just read what Jordan Clendenning had to say in the story Bill Hunt did for the Daily Gleaner. They both want to win. This is the AUS, where teams play to win every game and your biggest rival is always the team with the bus parked outside. 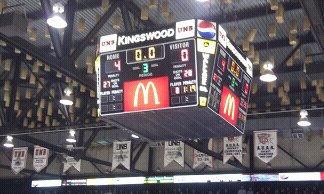 The season series went UNB's way. The V-Reds outscored STFX by a margin of 18-5 and took all 4 meetings. But that means absolutely nothing now. So wear Red, head to the AUC and cheer on the V-Reds tonight when they hit the ice in pursuit of an AUS Championship. Go Reds Go! If one is to believe the AUS website, the AUS Finals are going to be a best-of-5, with game 2 taking place Saturday night at the Aitken Centre. Game 1 was already confirmed for this Friday at 8PM. Games 3 and 4 (if necessary) shift to Antigonish on Tuesday and Wednesday (March 15-16). The date of game 5 has not been released yet. So, unless things change between now and when the puck drops tomorrow night, we should expect a pretty good weekend of hockey here in Fredericton. UNB's opponent for the AUS Finals, and the final team at the University Cup, were determined this evening with STFX's 3-2 double OT win vs the SMU Huskies in Halifax. This marks the second time in two years that the X-Men have bested the defending national champions in a best-of-five series. Full marks to STFX for erasing a 2 goal deficit to battle back for the overtime win in game 5. They will present a formidable challenge to UNB. For the Varsity Reds, it means a chance to avenge the loss from a year ago and carry some momentum into Nationals. We'll wait for the official word on the schedule for the AUS Finals, hopefully sometime tomorrow. We've received word that final details on the format and schedule of the AUS Finals are still being ironed out. Friday night at 8pm will go ahead for sure, so plan to be there in all your Red glory when the V-Reds hit the ice in pursuit of an AUS Championship. Final details on the series will be announced likely sometime Wednesday morning. The Varsity Reds revealed the dates of the first two home games of the AUS Final. This Friday night at the special time of 8pm, Game 1 will take place at the AUC between UNB and the winner of the SMU-STFX series that concludes Tuesday night. Game 2 will then follow on Saturday night at the familiar time of 7PM. The CIS Nationals picture cleared up considerably over the weekend. No surprise, the University of Alberta Golden Bears and McGill Redman will make the trip from their conferences. Joining them will be the Calgary Dinos and Western Mustangs. UNB is pretty familiar with all these teams. 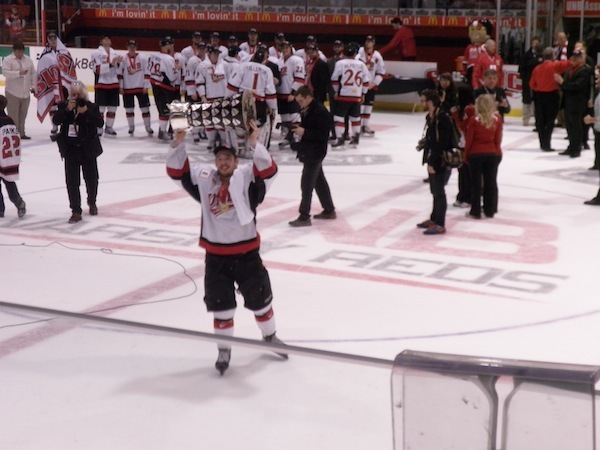 Alberta, Calgary and McGill were exhibition opponents this season, while Western was the opponent during the gold medal game of the 2009 University Cup in Thunder Bay. With one spot left at this year's University Cup, feel free to let us know who you expect it to be. WOLFVILLE – In big games your best players have to be your best players, and that was the case Friday night when the University of New Brunswick Varsity Reds answered an Acadia goal with three of their own and hung on for a 3-2 win. With the victory UNB wins the AUS semi-final series against the Axemen three games to one and wait to play the winner of the StFX-Saint Mary's series for the conference championship. UNB coach Gardiner MacDougall made a couple of lineup changes for game four, inserting both veteran defenceman Josh Hepditch (Fredericton, NB) and fellow d-man Jonathan Harty (Oromocto, NB) who has missed several games due to illness. Sometimes-defenceman Spencer Corcoran (Summerside, PEI) was moved up to play forward and bang bodies. UNB was a much more physical team in the first period than the the start the night before and early in the period Harty put a big hit on Acadia spark plug Ryan Graham (Mount Pearl, NF), and he saw little ice time after that. Despite good pressure in the period from UNB it was Acadia getting on the scoreboard first at 15:32. Andrew Clark (Brandon, MB) got the puck away from Kyle Bailey (Ponoka, AB) behind the UNB net and he fed the puck to Zach MacMillan (Brandon, MB) all alone in front of the UNB net, and MacMillan's quick release beat Travis Fullerton (Riverview, NB) clean. UNB answered just over two minutes later when Marc-Antoine Desnoyers (Hippolyte, PQ) hit Hunter Tremblay (Timmins, ON) with a long pass in full stride at the Acadia blue line. In a tremendous individual effort Tremblay fought his way through two Axemen defenceman, and with the referee's arm up for a delayed penalty, snapped the puck past Kristofer Westblom (Meadow Lake, SK) to tie up the game. Moments later Westblom made a big save off Tremblay to keep the score tied 1-1 after 20 minutes. UNB outshot Acadia 11-8 in the first period. UNB came out flying in the second period and at the 58 second mark Taylor Procyshen (Emerald Park, SK) took the body at the Acadia blueline to make a pass to Nick MacNeil (Creignish, NS) and was hammered to the ice by 6'4” Leo Jenner (Mossley, ON). MacNeil went in on Westblom and beat the Axemen tender with a wrist shot to give UNB the lead, while linemate Procyshen was slow to get to his feet. The next stoppage Prochyshen went to the UNB dressing room and did not return to the game. UNB increased their lead at 13:22 when Tremblay got the puck in the Acadia corner and fed Chris Culligan (Howie Center, NS) in the slot and his rocket shot beat Westblom under the crossbar. A MacNeil tripping penalty would prove costly as Acadia defenceman Chris Owens (St. John's, NL) waited for the screen to develop and then fired a point shot along the ice that beat Fullerton just inside the far post at 14:57. The Axemen appeared to take energy from that goal and pressed furiously. Acadia had a golden opportunity to tie the game a few minutes later – Desnoyer had carried the puck deep behind the Axemen net, and when he turned the puck over it created an odd man rush the other way and a hard charging MacMillan ended up missing a near wide open UNB net when Fullerton played the puck carrier Adam McIllwraith (Quispamsis, NB). The third period saw the Axemen going all out to tie the game as they fought to prolong their playoff lives. Fullerton was forced to make numerous big saves, with probably his biggest a glove save off McIllwraith midway through the period. The Axemen outshot the V-Reds 16-5 in the final period that had the Acadia fans on the edges of their seats. UNB advances to the AUS finals after a hard fought 3-2 win at Acadia. Scoring for UNB were Hunter Tremblay, Chris Culligan, and Nick MacNeil. Travis Fullerton was busy this evening and closed the door in the third period with Acadia pressing. Final shots were 33-28 for Acadia. The V-Reds will now wait to see who their opponent will be in the finals as STFX and SMU wrap up the other series. WOLFVILLE – Thursday night the Acadia Axemen scored on their first shot on goal, added another goal in the first period, and played a strong defensive game to defeat the University of New Brunswick Varsity Reds 3-1 and avoid elimination in their best-of-five AUS semi-final playoff hockey series. Ryan Graham (Mount Pearl, NF) missed the first two games of the Acadia-UNB series, but on his first shift he skated across the front of the UNB net and beat Travis Fullerton (Riverview, NB) with a quick backhanded shot just 52 seconds into the game. The Axemen appeared to have a lot more jump than UNB in the first period, perhaps to be expected from a team facing elimination, while the V-Reds didn't look particularly sharp in the early going. At 15:15 the Axemen extended their lead when Andrew Clark (Brandon, MB) sidestepped Hunter Tremblay (Timmins, ON) at the UNB blue line, and then let off a quick shot on the rush from the left circle that beat Fullerton who was deep in his net and didn't have a great angle on the shot. Late in the first period was probably UNB's best scoring chance, when Kyle Bailey (Ponoka, AB) used a skate-to-stick move to keep the puck onside and passed across the slot to Hunter Tremblay who then attempted to deke Kristofer Westblom (Meadow Lake, SK) but he couldn't get the puck past the Axeman goaltender. The second period saw the Axemen continue their solid defensive play, denying UNB time and space to freewheel, despite playing on Olympic sized ice at the Acadia Arena. At 8:23 of the second period the Axemen took advantage of a partially completed UNB line change to create an odd man rush, and captain Phillipe Bertrand (Cap-Sante, QC) slid the puck across to Scott Tregunna (Mt. Forest, ON) who had a gaping net to put the puck into. In the latter part of the second period UNB had several chances to score, particularly for Taylor Procyshen (Emerald Park, SK), but they kept seeing their pucks stopped by Westblom or sail just over the top of the net. UNB finally scored at 16:07 of the third period when defenceman Spencer Corcoran (Summerside, PEI) snapped a shot from the blue line that went through a crowd and past Westblom. But that was to be the last goal of the game, as Acadia kept pushing UNB to the sides on rushes, and then whenever the V-Reds did get into the Axemen zone all of the Acadia players collapsed back and took away the shooting and passing lanes in front of Westblom. The final shots were 32-24 in favour of UNB, but the Axemen got the all important 3-1 win to force a Game 4 on Friday night.